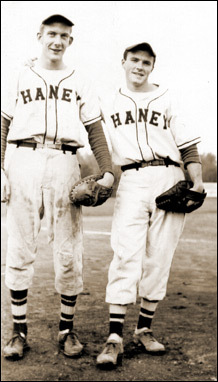 (Left) This photo of Neil Kelly and Jack Cameron of the Haney baseball club is believed to be from 1953, taken at Telosky Stadium. Kelly became a Roman Catholic priest and taught at St. Marks college at the University of British Columbia. Cameron, who went on to achieve PhD status, taught in Victoria, Edmonton, Calgary and Australia. For the information below we thank Frank Endreny of Oliver. Franks' dad was the Treasurer of the Oliver club in the 1950s and managed to hang on to some of the paperwork. $4.00 to the Penticton Hospital. Makes you wonder what $4.00 could have procured in those days. Below, a cheque for $25.55 to the Okanagan Mainline Baseball League. This could be the team's entry fee for the season. 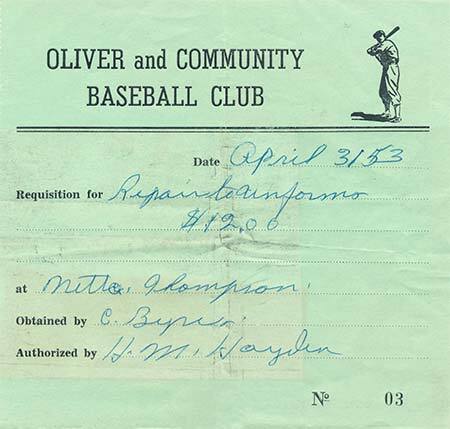 Then a payment of $43.59 to Richie Snyder, who was the Oliver playing manager that season. The amount appears to be too uneven to be a salary payment. 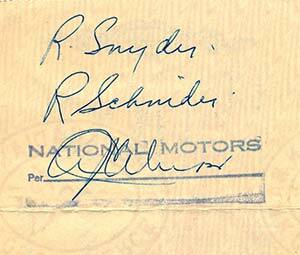 Beside the cheque we show the reverse with his signature - to confirm the spelling. While the cheque is made out to R. Snyder, Richie signs both R. Snyder and R. Schnider (which we have discovered to be the proper spelling of his name). Twelve dollars. Twelve dollars ! That's all she got for the repair of the Oliver uniforms. Not hard to guess that the work was on a few of the uniforms and not just one. Few teams in that era had the funds for both home and away uniforms and those that they had were pretty beaten up after the season. With the April date, it appears she was getting the previous year's jerseys prepared for the new campaign.